We all know it very well : Google search engine is a powerful tool and one that the majority of people use on a regular basis. As a merchant, setting yourself up to get on the first page of Google Image is of utmost importance, considering that it receives 95 percent of web traffic, with subsequent pages receiving 5 percent or less of total traffic. Therefore, how could you improve your SEO strategies to be showcased in the top results? The truth is that it takes resourcefulness, research, motivation, and creativity, because of the constantly-changing nature of Google’s algorithm. While we still don’t know the specifics of how Google’s algorithm works - and unless the EU’s transparency campaign kicks into high gear soon, we probably won’t for the foreseeable future - we do know enough about some measures to take into account in order to reach the top of a search engine results page (SERP). 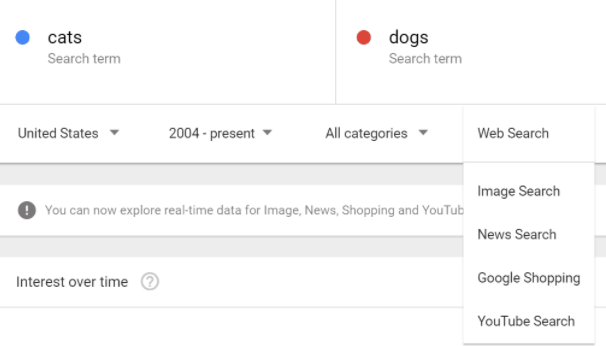 Nonetheless, you can compare search trends across Google search engines, for exemple dog vs cat . You should definitely keep in mind that the most common use of Google Trends for SEO is the analysis of peaks and troughs in consumer demand. The graphics here above give us two important information: first of all, if you are planning to create and sponsor an “ugly christmas sweater”, you should bear in mind that e-buyers are already making this kind of research on the internet in late October. Furthermore, if you had created a seasonal store and used the keywords “Christmas” and “Sweater”, be aware that this won’t help you to reach new customers at the beginning of the new year. Be aware that seasonal trends are also influencing the Google Ranking ! Using captions to surround the image will boost its ranking. It also helps once the user gets to your page to add context around the photo making it more impactful for the viewer. If you’re able to make it work though, it will help with SEO. Don’t underestimate the power of the image search. While optimizing your written content is of the utmost importance, it’s crucial to remember that searching by image only is very popular and you’d be remiss to leave visual elements off your site. That’s why the content and visual marketing strategies are both essential and we strongly suggest you to personalize your store and add banners, logos and a short presentation about your line (do not forget to mention some relevant keywords such as : custom, personalized, t-shirt, gift, creative, offer, …). Last but not least, naming the image file is just as important as the keywords in your page’s content. If you are adding a banner with some unicorns to your store don’t name it jpeg5hfTJj. Instead, call it unicorn-glamour-collection. Especially if you are adding your special products to the Teezily marketplace, you should carefully choose the tags and the designs’ category. Again, Google Trends will help you to find the pertinent tags (and you might check as well Pinterest and Instagram, do not forget these powerful social networks!). “Same same … but different”, the URL name of your store is fundamental: if you are targeting ski lovers, you have to add the keyword “ski” in your URL. Last but not least, did you know that well-organized and described Pinterest images have a better chance of reaching the top ranking ? You should register your account (it’s free!) and pin your products’ previews: do not forget to add a related description and to use strategic key words. The more likes and shares you get, the better influence on your Google Image ranking.Head over to Pinterest.com and register for a free account. Pin your products to your pinboard with suitable image descriptions. Use tools like Copyscape, SiteLiner, and Screaming Frog to make sure you’re not repeating yourself in your store’s description or page feeds? While the occasional duplicate content won’t destroy your rankings, you’ll be doing yourself a favor by showing Google that each piece of content is original, relevant, and useful. Be patient! Newly-created products won’t immediately appear in search results. But you can speed up Google indexing by sharing links of your Shop or of your products on the Teezily Marketplace on your social media channels. Create multimedia content, and consider that video advertising could also help you to escalate your Google ranking. Your goal is to make the best social media page on the internet for that topic. Don’t try to trick a robot. Do try to help people find the information they’re looking for: Add details, customer pictures, examples, links to other stores, graphics … Don’t just add keywords. Make it a better page in every way you can ! We hope you enjoyed this content and we kindly ask you to not hesitate to share your feedback and doubts with us! Leave us a comment here below and enjoy your sales!